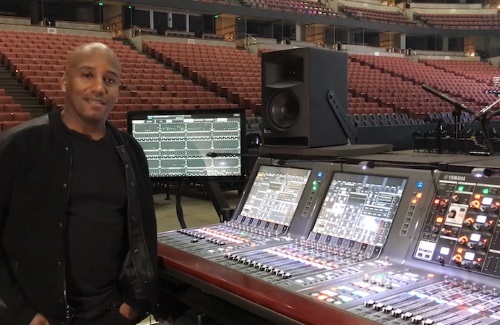 Front of house engineer Jose Rivera selects RIVAGE PM10 digital audio console for stadium and arena tour. Singer, actor, producer and top selling tropical salsa artist of all time, Marc Anthony, is currently out on “The Legacy Tour” and his front of house engineer has been taking a Yamaha RIVAGE PM10 digital audio console along for mix duties. For over nine years, independent engineer, Jose Rivera, has mixed front of house for Anthony. He also alternates mixing duties for Anthony with artist, Ozuna. Both artists are performing to sold out concerts in large and mid-size arenas, and in Central and South America, large stadiums. “I chose the Yamaha PM10 for its sound, capabilities, dependability, and ease of use,” states Rivera. Quite familiar with Yamaha consoles, Rivera said he has toured with many Yamaha consoles including all of the PM analog consoles, along with PM1D, PM5D, M7CL, CL5, LS9, DM2000VCM, 02R96VCM, and 01V96i digital consoles. After his initial demo on the RIVAGE PM10, Rivera spent time preparing his mix file on the PM10 and was up and running.